The Cube, a personal 3D printer from 3D Systems, Inc.
3D printing is here to stay. 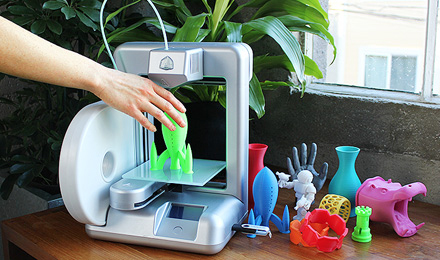 Personal 3D printers are already available for non-outrageous prices. And like so many technologies, they’re only going to get better – and cheaper. Already, the low-end models give you 200-micron precision and 16 colors, while the high-end models are printing parts for F-18 fighter jets. Plastics are here; other materials, like metal, are coming. I don’t have one yet, but I’m sure I’ll buy one when the price goes down a little. But what could you make with a 3D printer? The best Halloween costume ever, custom-designed and perfectly fitted to your body. Picture frames, exactly the size and shape you need. Jewelry of all kinds: bracelets, necklaces, even rings. Any style you can imagine. A voodoo doll that looks just like the person you want to, er, vent your frustration on. Disbelief in the voodoo is handy for removing ethical complications! Action figures of underappreciated characters. Miniature replicas of famous places like Westminster Abbey or the Arc de Triomphe, or not-so-famous places (like your own house!). Sculptures: no longer limited by sculpting ability. Paper clips shaped like Cthulhic tentacles. Custom PC cases sweet enough to put Alienware out of business. N-sided dice for your D&D sessions. Wedding centerpieces that look like Ambassador Kosh. Because why would you not do this. So tell me – what would you make with a 3D printer? You just gave me some great ideas. Once metal gets to be used you could make kitchen utensils, some cool knives, forks, spoons…etc. You could make great cuff-links for any occasion. You could make a bicycle frame, all you’d need are the wheels and chain to finish it. I would make containers/tupperware that’s perfect for whatever food you carry around. For example I would like small tupperware that snap together like legos so you could carry several small dishes easily. (rice+kimchi+gyoza+small amount of soy sauce) without having to dump them all into one large tupperware. Ok so that last one I probably won’t but I can see people making “love” dolls of their favorite celebrity or even creepier of someone they know. They’re already talking about “3D copying” – a 3D scan, and then a 3D print. I’d never thought about your last scenario before, scanning a person and making a replica of their body. But I could definitely see that happening.